Value Village (Your Thrift Department Store! )’s pattern section was absolutely stuffed this week (double the size it was last week) and what it was stuffed with was Vogue patterns. 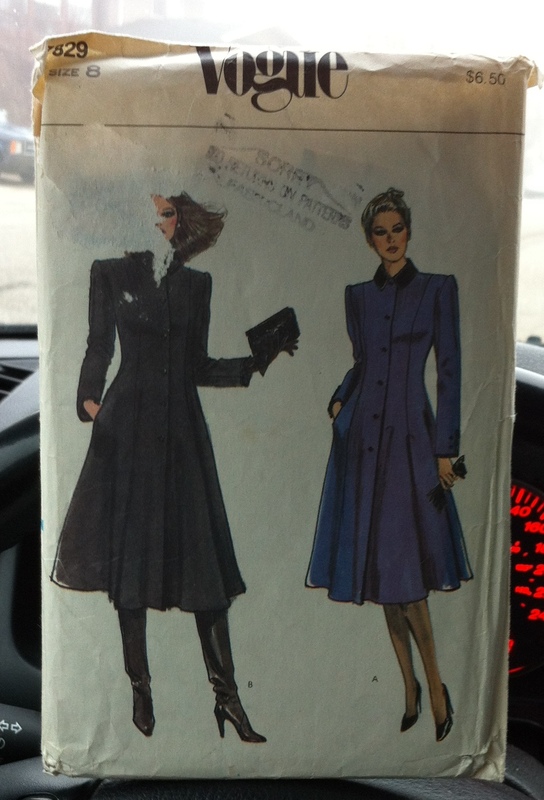 Unfortunately, it was stuffed with 80s Professional Woman Power Dressing Office And Evening Chic Vogue patterns. Even for $0.49/apiece, I couldn’t justify more than a couple. And, some more kids’ patterns. It’s an addiction, I tell you, because I know that my kids won’t wear most of these. Because I’ve been trying to clean up my basement (rather than sewing) in the evenings this week, and thus have nothing to write about, I’m going to witter on about the patterns a bit more. They’re not really deserving of it, but I fee like it. 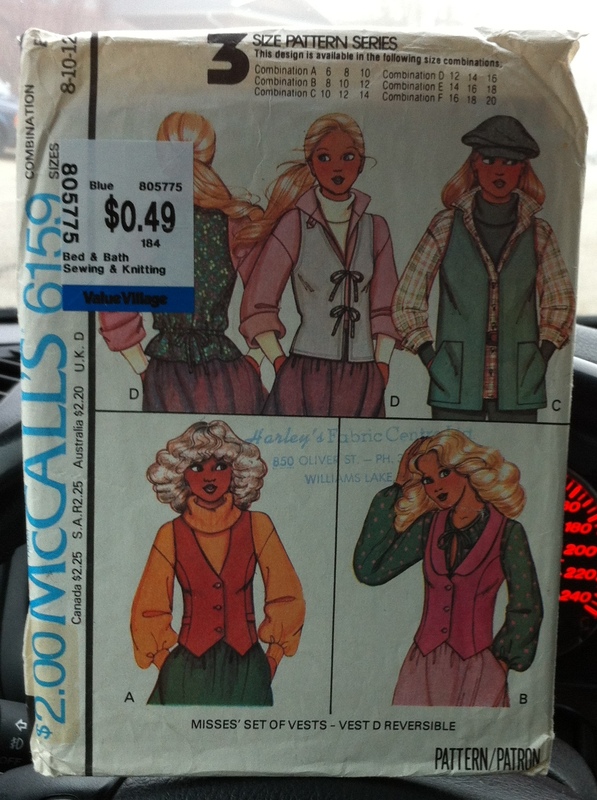 I’m developing a soft-spot for these McCall’s “Carefree” patterns almost as big as my 70s Simplicity weakness. Although I think in this case it’s mostly for the charming illustration. I like versions A and B, though I never actually wear vests so it’s probably not a really smart purchase. Speaking of McCall’s Carefree. This one is a Young Junior/Teen pattern, size 7-8, which is for someone with a 29″ bust and 32″ hips. Another pattern smack in between Tyo’s size and mine. What is it about those 70s athletic shorts with the contrast binding that absolutely undoes me? Oh, yeah. This probably explains it. The photo is from about 1983, but the clothes were probably pure 70s hand-me-downs. 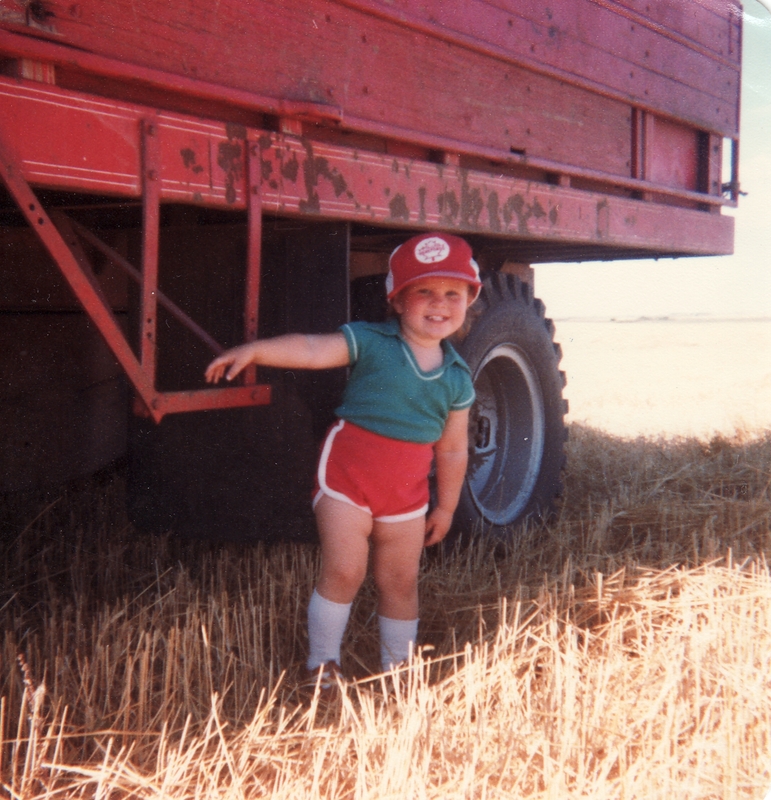 Obviously my love for short shorts, kneehigh socks, and the colour red was established early. Yuck on the jacket and the pleated skirt (although note the boxy 20s silhouette again), but I really love the tucked cami. Of ocurse, it’s basically some lightly-shaped rectangles, but y’know. Fifty cents. Vogue. This is probably the crowning glory of the “score”—great full-skirted, princess seamed coat. Wait, where have we seen that before? On the upside, the Burda Magazine issue I won on Alexandra Mason’s blog a few weeks back finally arrived! It’s the October 2010 issue, which has at least two patterns that jabbed me in the eye saying “make me make me makeme” when they showed up on Burdastyle. and this fitted-bodice, gathered skirted dress. Oh, and Tasia just released the new Sewaholic Pattern, Cambie, a gorgeous, sweetheart-neckline, fitted-bodice, full-skirted dress. I’m trying to read blogs but even that is almost too much work, never mind commenting. Argh. My goodness you were a cute little kid. Those shorts are just adorable! Rest up and take care of yourself. I hope your tummy settles soon, I’d hold off on the ibuprofen if you can, or go for tylenol. Ibuprofen can be hard on your stomach. When we can’t sew we ermmm… acquire 😉 On that score we both follow suit! I love the illustrations on pattern envelopes. In fact (I HATE to admit this!) 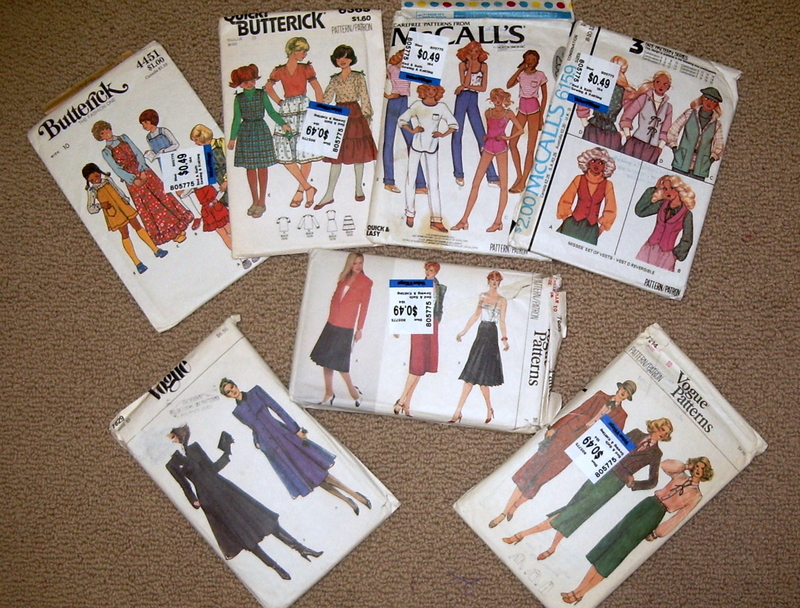 but I have bought several patterns just for the illustrations! EKS! Call me crazy (or maybe a hoarder?) needless to say, it was a sad day when the BIG 4 went to photos for the patterns and gave the fashion illustrator/artist the boot! Ok, confession time. I’m a sucker for 80s patterns and big-haired illustrations. And no one wants them so yeah! The 80s had so much 40s styling in it. I have a friend here who is a buyer for 80s vintage designer stuff and it’s really made me appreciate some of the grown-up clothes from that period (I was still a teen but that was what we aspired to!). As someone who suffered from gastroenteritis TWICE last year I feel uniquely qualified to give advice on the diet following the, um, ahem event. You have it right with electrolytes, add jello (regular not sugar free), and saltines, fruit when it doesn’t sound disgusting. After that you should be able to eat regularly. Take care. Mmm, jello would be nice. I have managed to keep down some cereal, so that phase may be passing. It’s not a long-lasting bug, judging by Tyo’s experience, but it is nasty. 🙂 Thanks for the tips. It was worth it—cereal is my major comfort food. I did use the lactose-free milk. OK, all I can focus on in this post is the part about the stomach bug being the grossest thing you have experienced since childbirth. OMG. Stomach bugs are so HORRIFYING. Awww, I am sorry you aren’t feeling well. Hopefully you can get lots of rest this weekend. 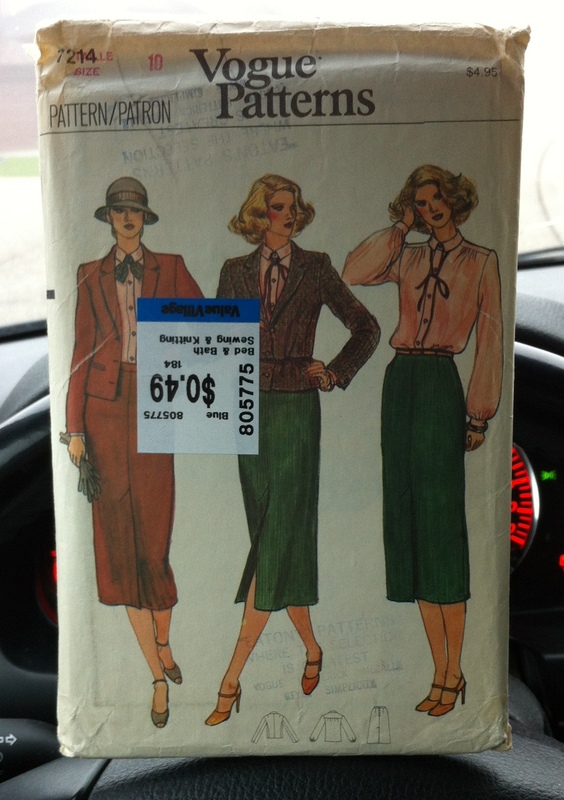 And – nice to find Vogue Patterns for $0.50! I do like that coat pattern a lot too. I know! It was hard not to buy them all on principle. Thanks for the well-wishing. Hope you feel better soon. On another note I am envious of your VV. Mine hardly has any patterns these days and when they do they are double the price of yours!! 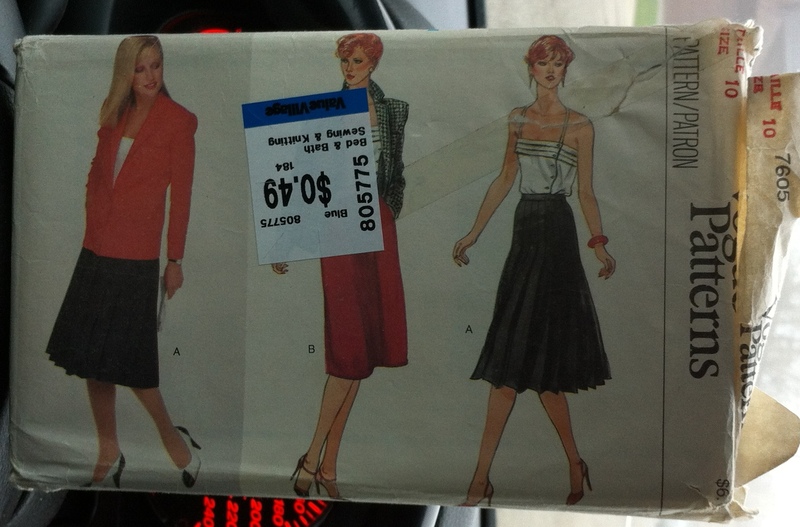 Value village sells patterns???? ?Hubby hates second hand stores but maybe my mother in law would take me!In the uk id checkout the charity stores weekly but here in Canada they are not within walking distance ….sigh. Yes they do and they also sell fabric, that is where I got my latest goodies. I sympathize The Husband hates thrift store with a red hot passion. Really hates. My mum had 7214 and made me a very nice slate blue garbadine pencil skirt from it. I remember it well! That Burda dress reminds me of the new Sewaholic one, just with a cut out neckline instead of a sweetheart. I’m drawn to the spinning picture though. 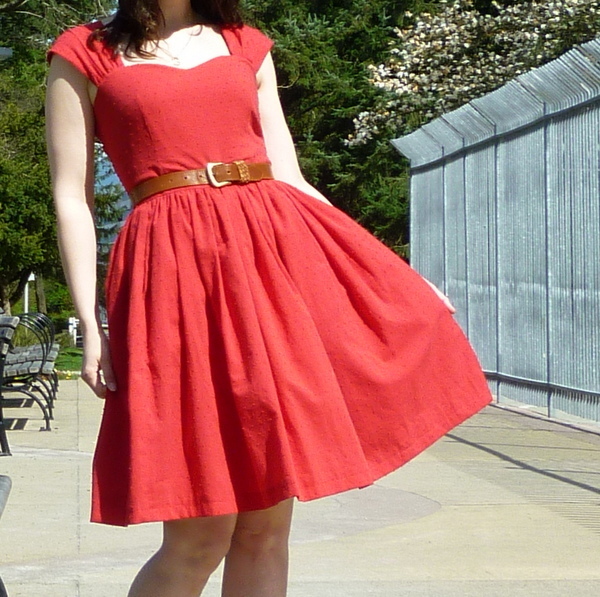 And the bright color of the Burda dress. Is the Burda dress skirt pleated? Yeah, the overall style is definitely similar, just with different details. 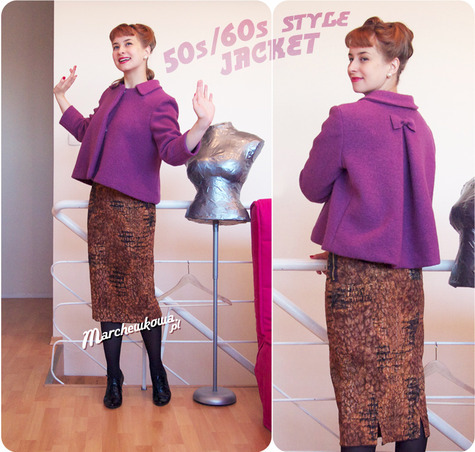 The Burda skirt does seem to be pleated in some interesting ways. That photo of you is adorable! 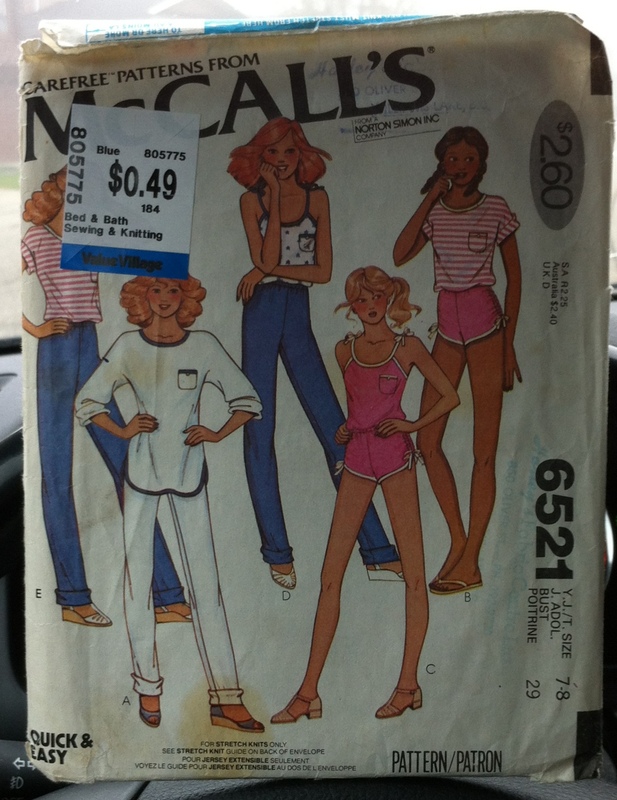 I had that McCall’s 6521 pattern and sewed the heck out of it. It was one of my favorite go-to summer patterns. I think I have a photo around somewhere of me wearing that little tank and those running shorts. I’ll never sew it again, but I repurchased the pattern just because of the happy memories.